The underlying desire — that programming ought to involve rigorous, logical reasoning about clearly defined abstractions — is largely correct. The confusion arrives when the content — this ability reason precisely about very imprecise things (like the real world) — is confused with the form, some magical ‘X’ that instantly elevates any activity to programming. Unfortunately, like all idolatry, it’s not a rational conclusion so disabusing individuals of such notions is terribly difficult. But I think they all come around eventually. All disciplines that don’t participate in metaphor, that revolve around creativity in the face of severe constraints, eventually come to realize that less is more. A) It’s doing fabulously well and they can’t make enough. B) They don’t want inventory of 1.0 with 2.0 on the way. C) The device is a dud, Amazon is losing their shirt on it, and they just haven’t cancelled it yet, but they sure don’t want to sell any more. Along comes an article from Compete to pique my interest. What they had to say is that at least the search interest in Kindle remains steady, that it has completely knocked the Sony reader (which I actually noticed at a bookstore the other day) off the map, and that the demographics are skewed older and richer than normal gadget-buyer demographics. That still doesn’t tell me whether I’d better wait for 2.0, but it suggests the device won’t be cancelled. Meanwhile, they’re still out of stock. I just checked. Tipping Points, Personality Styles, and Email: A-List or Spam? Guy Kawasaki recently wrote that you could “Forget the A-List After All.” The post was based on a Fast Company article on Duncan Watts, a Yahoo researcher and academic who believes Malcolm Gladwell’s celebrated “Tipping Point” concept is wrong. Both articles are a fascinating read, and really rocked my world thinking about them. I was surprised not to find more chatter in the blogosphere about it, because if Watts is right, it has huge impacts for marketing and social networking. It’s on Techmeme, so I guess people are still pondering what it means. The short form says that Watts has concluded that key influencers (what Kawasaki refers to as the “A-List”) actually have very little impact on how fast ideas spread at all. Rather, Watts feels its more a matter of whether the world is ready to accept whatever the message may be. If it is, then anyone can spread that message. There are no key influencers. Nobody has undue influence over others. Anyone can spread the word if the word is ready to be spread. – Facebook shouldn’t bother with Beacon, what your friends do doesn’t matter to you. Just as long as you are able to hear from anyone about something, that’s good enough. – Markets shouldn’t bother trying to reach the A-List of influencers. It’s more important to make a lot of impressions than to make the right impressions. Even more important is to tune your message, because if all impressions are equal, that’s all you have to work with. – Spam works if the world is ready to receive your message. As for Watts, I find I seriously disagree, but after thinking about it for a while, I can see ways in which Watts may be partially right. Or to put it another way, I can see how to value what Watts is seeing, but think he hasn’t seen the whole picture. Watts, for his own part, admits he may be wrong, but he’s quick to add that he thinks he’s the only one who clearly says what he’s talking about and has real data and models to back it up. Basically, he has experimented with how fast word of mouth spreads via email, and also with computer simulations where he can change various parameters and watch their impact on the simulation. Let’s get that data out on the table right away, at least as much as we can understand based on the Fast Company article. The email test involved signing up a very large group to see how fast they could propogate a message to a desired audience they didn’t know directly. Watts reaffirmed the old “six degrees of separation” rule of thumb when he mapped out the paths the mail took, but he also discovered little evidence of the key influencers. Yes, there were some, but quite a lot of the messages got through without recourse to influencers. This is in contrast to Gladwell’s experiment which involved written letters and was heavily impacted by the influencers. Half of the letters that got through came via just a few of these influencers. It is interesting to keep in mind that the other half didn’t need the influencers. The second thing Watts did was to create a computer simulation of a network of communicators. The simulated communicators were given various characteristics. For example, simulated Influencers were about 10% of his simulated population, but they had 4x the influence of mere mortals. The sim started when one of the population got an idea and tried to pass it along to others. Watts found that more often than not, even when he upped the Influencers to 10x the influence, the viral wave was due to non-influencers. What does these experiments mean? I think there are several interesting and intertwined phenomena potentially at work here. What message are we spreading? Probably the easiest message to spread is humor or something interesting. A great LOL Catz picture can come from anywhere. It doesn’t need Influencers to get out there. There is very little cost or risk associated with accepting such a message. Perhaps the next up the hierarchy would be news. News may cause us to act, but since we generally don’t associate that action with the person delivering the news, we will still take news from a broader range of sources than perhaps even we should. Witness cases where bloggers break news or news appears on Twitter. Another step up is a message that tries to get us to take action that has a cost, but that apparently does not benefit the sender. Last step, just like the former, the message wants us to take action that has a cost, and taking that action benefits the sender. We are most suspicious of the latter. Seth Godin puts it well when he says the old saw about it’s who you know is wrong, it’s really more about who trusts you. Neither of the experiments attributed to Watts appear to consider this issue at all. Until experiments like these are carried out with messages that have real costs, such as purchasing a product or service and potentially being unhappy with them, I’m not sure how relevant they are. Certainly I wouldn’t just take them entirely as gospel. Watts can talk about how the evidence of others is anecdotal, but it is a near universal anecdote that people have varying levels of trust for the person delivering the message, and nearly all of us know of individuals we rely on for advice. I’m fascinated by the choice of email in Watts’ experiment versus written letters for Gladwell. Today, there are many more media formats available to us. What’s the best one? Do they behave differently? Is a random email really a good test for influence, or would we call that Spam? Do we need richer media to communicate strong influence? 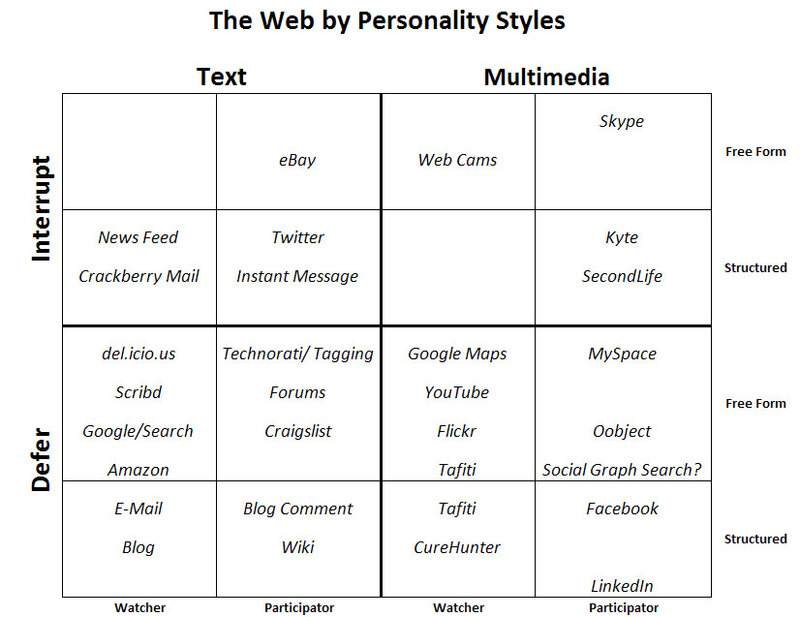 What sorts of messages generate the most influence with which media? Is it simply the news that a person you respect has made a purchase? Or do you need to see their purchase and experience their enthusiasm? Or perhaps you need to see other people getting enthusiastic about your friend’s new purchase? This sort of thing accounts for the love/hate polarization that people have for things like Twitter or Video: its a matter of your preferred learning style. I have no idea which styles are more popular, it’s even likely that it’s too early to tell–not enough data for many services. But I’ll bet they have a huge effect on all this. In fact, one of the things Influencers may instinctively do well is to know what style of communication and messaging works best for the person they’re communicating with. The online world provides so many new ways that tipping points can come into being. They also provide a lot more interesting ways to help try to get the word out. For the first time are crude measures of the degree of connectedness various individuals have. For example, by the number of friends they have on Facebook or the size of their LinkedIn network. Perhaps the next stage would be to think of ways to measure the efficacy of these relationships. Lastly, the web enables sheer brute force. If all else fails, it is cheap to create tons of impressions on the web than by purchasing Super Bowl Ads. I still think you’re better off thinking about who to impress. If it didn’t matter, as Watts seems to say, the “Digg” effect would be more valuable. If you’ve never heard of it, it’s the phenomena where an article is linked into Digg, Techmeme, Techcrunch, or whatever your favorite attention concentrator du jour may be. This will drive huge traffic. The trouble is, the traffic disappears again almost immediately. OTOH, folks like Andrew Chen have written that when Robert Scoble links to you, your subscriber list of repeat visitors is permanently enhanced. It sure sounds like Scoble is a Gladwell-style Influencer and Watts missed the point on that one. Sweet irony: David Armano writes that he had the Fast Company article in hand and never read it until influenced to do so by Guy Kawasaki. Zoli Erdos wrote an interesting blog post about hiring big company executives into startups. Dharmesh Shah tarted up Zoli’s already nice linkbait “Beware of Suits” with “Why Your Startup Shouldn’t Hire Seth Godin”. Dharmesh skirted dangerously close to the “only young people make good entrepreneurs meme.” What are these guys saying and what does it have to do with Moccasins anyway? – These people had done it already and so would be bored doing it again and couldn’t perform well without challenge. – Too much success makes it hard to take the pain inherent with any startup. Highly successful people may be looking for smooth sailing, and so may not be the fighters a startup needs. – You can’t hire people who take the job for equity. You can’t hire people making a lateral move. You need hungry driven fighters who have to step up to do the job. – You want people who are after passion and lifestyle, not a job. – Corporate hotshots are leaders, not doers. Startups need both in one package. – You gotta catch the right wave: 1st wave want to create success from nothing. 2nd wave want to make something popular more successful. 3rd wave want to join a successful environment and preserve the status quo. – Even if past success predicts future success, it assumes similar circumstances. Every startup will be different. – More about how prior success leaves people not feeling hungry enough for a startup. They don’t have a point to prove, they’ve already proven it. – Startups are an arbitrage game. Good startups can hire world class people below market value. Startups are playing a passion arbitrage game. – Executives from big firms are helpless without the giant budgets and resources of big firms. Okay guys, that’s all very interesting, but way too black and white. Let’s dig in. I’ve been in both worlds a lot in my career. I’ve founded three startups, two of them very successful. I’ve been at world class big companies like Oracle and Borland (in the Borland heyday I ran their 350 person R&D team). I’ve worn both pairs of moccasins, in other words. And as the saying goes, “Walk a mile in the other man’s moccasins before judging him.” I’ve seen all of these things you mention, but I look at them a lot differently. Let’s start with passion. Passion exists at all levels and all company sizes. Startups do not have a monopoly on passion. If you’ve never met someone who is completely driven and passionate from a Big Company, it’s your loss. These are the people that carry on with hard jobs that require passion to sustain them long after they’ve made enough money for multiple mansions, countless Ferraris, and jets. If you think Steve Jobs, for example, doesn’t have passion, you just haven’t ever watched the man enough. This kind of Passion takes hold and is not controllable. If you have the real passion we’re talking about, it can be painful. Your family and friends look and wonder what your problem is. Why can’t you settle down and relax a little bit? You don’t need the money. Ease up, don’t give yourself an ulcer. Most of the people I’m talking about have known passion all their lives. They didn’t just discover it and start a company. It’s part of their DNA. People with passion ignore the pain. Their real pain is not being able to exercise their passion. It triggers massive impatience and sometimes anger. Passion is unreasonable. Take Scoble’s recent post about Facebook’s Zuckerberg. The Zuck says a lot of his problem with PR is because he is extremely shy. Yet Scoble felt the passion from this guy in spades. You can read it in his post. Shyness just makes it worse. Here’s a guy exploding with passion but too shy to get it out there. He’s a steam boiler with the safety valve screwed all the way shut and the pressure building. So what does he do? He goes with a vision and creates a place where shy people can expose some passion on the Internet. Do you think his passion goes away because of money or what he’s already accomplished? He could likely sell the company for a quarter of that $15B valuation and net more money than he could ever spend. There’s probably a list of companies that would pony up that cash right now if the deal were offered. Zuckerberg is already past the stage where he could be hired by the standards of these posts. Money or past success can’t take this kind of passion away. So look for passion in the people you interview at a startup. Find the people who are obsessed, who can’t sit still, who light both ends of the candle and then set the middle on fire too. Find a way to measure and test for passion. And keep in mind, people with passion are unreasonable people at some point. Drive past the interview face and test for some unreasonability. If you can’t get them to disagree with you on anything, maybe there is no passion. Next point is what I call content producers versus managers. This was definitely brought up, but again, I look at it differently. It is the leader/doer angle. This is related to the requirement for a lot of resources to get anything done. A doer can produce content for their job description of some kind. A pure leader can only evaluate other people’s content and help push them forward. Pure leaders are not necessarily inappropriate, but having both leadership and content creation capability is more helpful for a startup. To many pure leaders and the startup can’t get anything done. The Big Co has the opposite problem: tons of raw talent that is very hard to marshall, organize, and fire up. Figure out how you’re going to evaluate whether your new hires are doers. What can they produce that’s relevant to you. I like to use working brainstorming sessions to do this. See how well your candidates can riff on your space and ideas. Rather than refute all the rest of the points already brought up against looking at people who’ve done it before or that are in large companies, I want to talk about things those people have going for them that a talented and very impassioned but raw alternative may not. First is the past success predicting future success. If you don’t have any past success, what exactly is going to be the predictor? Why go out of your way to ignore past success because you think it may have tainted a person? Hopefully I’ve dispelled that notion. Dig into past successes. How varied are they? Does the candidate have an ability to adapt to broadly different situations? My own resume is a crazy hodgepodge of desktop software, tools, Internet software, and Enterprise application software. People ask me what I want to do next and whether I’m an Enterprise only guy and I just laugh. Serial success players have skills, talents, knowledge, and tactics that get them over the hump. Figure out what those are and whether they apply to your situation. Second, folks in larger organizations and with many successes have more contacts and credibility. Both are extremely valuable to a startup. Startups have to sell up out of a hole. They have to convince people they’re credible. As a very talented executive recruiter friend once told me, people like to associate themselves with success. Startups that don’t have any yet can benefit from the surrogate success of their players. When people are considering a purchase from a startup, there has to be a reason. What’s different about this startup? One of the answers is that someone with credibility is there with a lot of passion for the startup. Don’t sell that short. Also don’t sell short the ability of that person to lean on their network to get things done. To bring more talent into the startup, for example. To hire the right person or agency because a past relationship lets them know that person or agency will succeed. Last point is experience matters. I’m fond of saying that old age and treachery can often overcome youth and enthusiasm. Get some of that experience on your team. It doesn’t matter how smart you are, if the other guy already answered the question a long time ago and knows the answer, he will beat you to the punch while you’re figuring it out. Having experience to draw on is a rich source of data, and startups are data challenged. Don’t fall into the trap of thinking the startup only has to do everything completely differently from what’s been done to win. There may be a winning formula there, but there will also be lots of failed startups if you take that to the extreme. As an entrepreneur and startup, you don’t have the luxury of the VC’s portfolio effect to sort that out. If it isn’t obvious by now, I’d hire Seth Godin in a heartbeat. You’d be silly not to if you’ve read his stuff enough to realize he has the qualities I’ve talked about. The real question is whether you could get it together to convince him to join you. Bravo Karen! It’s rare that organziations can acknowledge their weaknesses, and this is often a necessary precursor to getting on with a solution. There remain many cultural, and some technology barriers to SaaS adoption, but when you read the US Government is thinking more about it, you have to figure the worst is over. Time Warner is toying with the idea of limiting your Internet access in terms of how much bandwidth you can access in a month. This bad idea has got the web atwitter with various comments and has been buzzing around Techmeme for a few days. Apparently the move is prompted by the realization that half the network bandwidth usage is due to just 5% of customers who are taking what the ISP views as an unfair share. They’ve been trying for years to penalize the other end of the transaction, not the customer downloading, but the businesses serving up the downloads (a concept called network neutrality). The latter is much like the Post Office wanting to hit up Neflix for running up an inordinate share of mailing costs. Unfortunately, while this is all predicated on that 5% of unreasonable customers, the fear is that rising use of online video will cause many more customers to be impacted and could stifle growth in these new areas. Some other countries have had caps like this and worse for some time. I just can’t get warm to the idea though. Bandwidth is a commodity that gets cheaper to deliver by the day. There is a ton of dark fiber out there: fiber optic that is in the ground but isn’t even being used. We can send more data over a fiber than ever before. Perhaps the only problem in sight is that a new generation of routers may be needed to take us to the next level. I agree with Stacey Higginbothom who says this is really a symptom of the duopoly or poor number of choices among broadband providers that most communities have. As usual, these companies cry out that they must be granted monopolies to build the infrastructure, and then they deliver mediocre service. What is irksome is that the monopolists get to change the deal after the fact without recourse. Services like this should get better over time, not worse. The reality is that this is just another example of a company creating Artificial Scarcity. The strategy doesn’t work in the Digital Age, at least not for long. What it does is to provide the fuel for someone else to come along and disrupt the heck out fo the monopolist that put it in place. The RIAA are the best known example of a bunch that lost out after creating Artificial Scarcity. Time Warner will find that if their changes are onerous enough, people will look for alternatives, and it will be profitable for others to produce the alternatives. The irony is that big companies have watched this strategy tried and failed many times and yet they still keep bringing it up. Not enough B-school cases on it I guess.